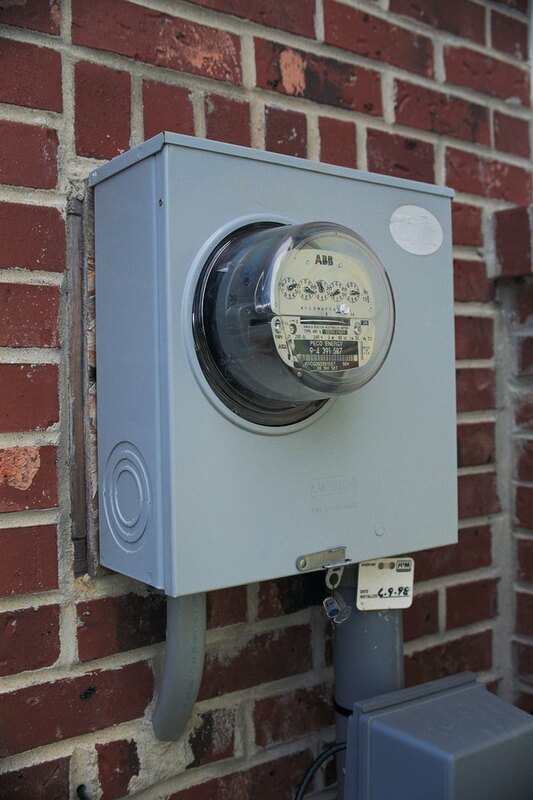 An electric meter box is sometimes called an electrical meter pan by electricians. The electric meter box houses the electric meter socket where the electric meter is plugged into. The electric meter socket contains three pairs of terminal lugs that hold the main electrical cables running from the service drop. Installing an electric meter box involves mounting the box and the riser pipe, then wiring the cables that run to and from the meter. Installing an electric meter box is a task that requires electrical training and experience which is why some states require an authorized electrician to performed the task. Electrical meter pan is another name for the meter box. Place the meter box on top of a of 3/4 inch thick plywood and trace the box outline with a pencil. Add an extra inch on each side of the outline, then cut the plywood along the outline with a wood saw. Locate the wall where you wish to mount the meter box and determine the location of the studs behind the wall with a stud finder. Mark the position of the studs with a pencil. Hold the plywood backing upright against the wall and align the plywood vertically and horizontally with a level. Nail the plywood onto the studs with a hammer and 1 1/2 inch nails. Place the meter socket hub onto the opening on top of the meter box and fasten it with screws supplied with the hub. Hold the riser pipe vertically on top of the meter box and screw its end onto the socket hub. Align the pipe vertically with a level. Attach a cable clamp near each end of the pipe, and at 1/3 and 2/3 of the pipe length. Climb to the top of the rigid conduit pipe using a ladder. Insert the end of three cables into the opening on top of the rigid conduit pipe pipe and drop each cable down to the meter box. Unscrew the meter box cover and pull the cables from inside the meter box, but leave 18 inches of each cable dangling on top of the pipe. Hold the 18-inch cables and slip the cables through the weatherhead. Plug the weatherhead onto the top of the conduit pipe. Hold the cables inside the meter box. Run the two black (hot) cables to each outer terminal lug (hot) on the upper half of the meter socket in any order. Route the neutral, or black cable with white tape to the center terminal lug (neutral) on the upper half of the meter socket. Cut the cables with diagonal pliers, then strip off an inch of cable insulation from the end of each cable, using the utility knife. 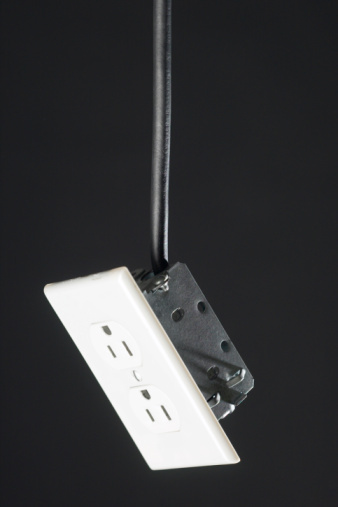 Plug each cable onto its corresponding terminal lug and tighten all lugs with an Allen wrench. Insert the cables running from the electrical panel through opening at the base of the meter box. Route each black cable (hot) to each outer terminal lug on the lower half of the meter socket. Route the black cable with white tape (neutral) to the middle terminal lug on the lower half of the meter socket. Strip off an inch of insulation from the tip of each cable and plug all cables into their corresponding terminal lugs. Tighten all lugs with an Allen wrench. Slip the grounding wire running from the ground rods through the opening at the base of the meter box and wrap the wire around the grounding screw in the meter socket. Tighten the screw, then replace the cover of the meter box. Call your local government agency in charge of electrical installations to have the meter box inspected.